Spring has finally arrived in the GTA. As it always seems to happen, spring will fly by and in a matter of weeks it will be summer. I have neighbours already opening their pools in anticipation of the heat and we have started to receive calls about outdoor tropical trees for pools and decks. Adding a few 8-10 foot palms in containers is a very simple way to add huge impact to your landscape. Chosen carefully, these will thrive beautifully for the entire season. None are winter hardy however. If you have the space, they may survive indoors over the winter, but we usually advise our clients to treat them as annuals. Smaller palms or other tropicals look great in urns, either on their own or surrounded by colourful annuals and ivy. Some of the palms you may consider for outdoors are Adonidia, Phoenix, Sago, Bismarck, Fan, Kentia, and Fishtail. The first four can tolerate full sun. Fan, Kentia and Fishtail Palms are better suited to shaded decks and patios. The Kentia is a beautiful tree for a covered porch. 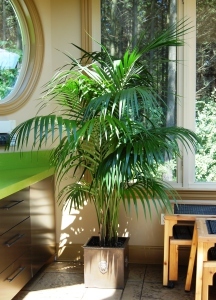 Because the Kentia is a low light palm, it will likely do well when brought indoors in the fall. 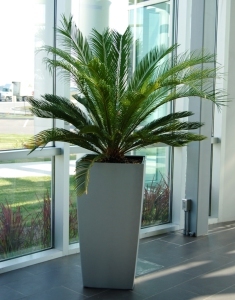 The Adonidia Palm is available in heights of up to 14-16ft. The others are available R 3-4ft and up. The Phoenix Palm has delicate fronds that sway with the slightest breeze. The Bismarck is a striking tree with huge fan-shaped silver fronds. All palms need good size containers with drainage holes. Make sure to purchase the appropriate soil. Only one type is suitable for this application. Keep the trees moist at all time. In hot weather they may need water every day. Very few garden centers carry large palms. We often refer our clients to Valleyview Gardens in the GTA. www.valleyviewgardens,com By early May they will have a huge selection of outdoor palms as well as flowering tropicals and are experts in the selection and care of these trees.